The Native American Silver Dollar series has become an instant favorite among collectors since its launch in 2015, its popularity enduring as it’s continued to honor several tribal nations. Eventually a total of 50 tribes will be commemorated through this series, issued by the Native American Mint. Each coin celebrates a unique state, tribe and animal associated with a Native American tribal nation, in order to raise funds for Native American charities and increase awareness of Native American culture. Importantly, these are the only American, non-US government coins available to collectors today. The fifth coin in the series is the Pennsylvania 2015 Silver Skunk Iroquois Proof, celebrating the extraordinary Iroquois nation. Historically, the Iroquois of the American Northeast were among the most fearsome and powerful tribes--known to the French as the Iroquois League, and later to the British as the Five Nations, and eventually as the Six Nations around the American Revolution. Today there are nearly 125,000 registered tribal members, split between Canada and the United States. Now you can preserve the cunning strength of the Iroquois and the wily resilience of the skunk with the Pennsylvania 2015 Silver Skunk Iroquois Proof, available at GovMint.com. 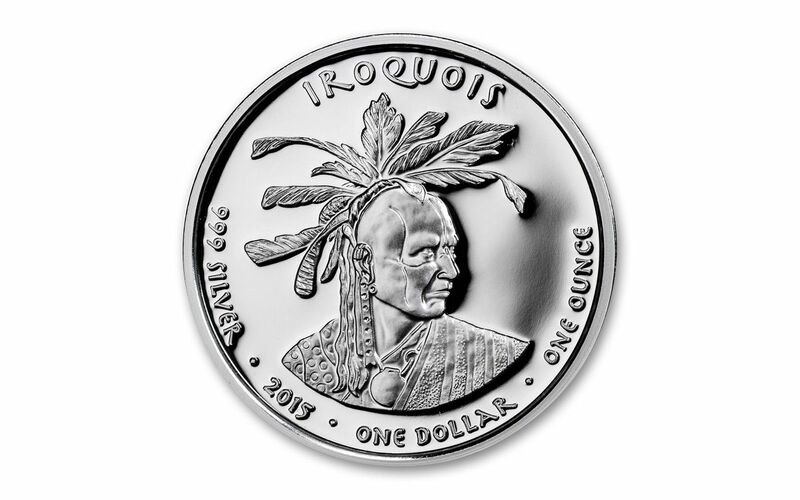 The Iroquois warrior was an awe-inspiring combatant whose legacy is perfectly captured in the 2015 Silver Skunk Iroquois Proof coin, which weighs 31.1 grams, and stretches 39 mm in diameter. A COMPETITOR NOT EASILY BESTED -- The Iroquois nation struck fear in the hearts of its enemies, so perhaps it’s not surprising for this mighty tribe to be featured on a coin that also depicts the skunk--a diminutively-sized animal that also makes its competitors stop short. The obverse of your Pennsylvania 2015 Silver Skunk Iroquois Proof coin features an unforgettable portrait of an Iroquois Indian in full headdress with war paint across his face, staring to his right. Stylized inscriptions on the obverse include "IROQUOIS," "999 SILVER," "ONE OUNCE," "ONE DOLLAR," and the date "2015." 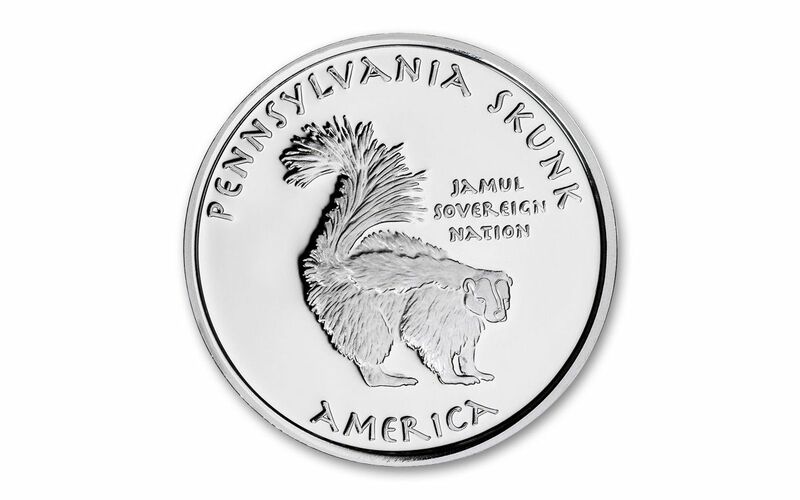 The coin’s reverse features a skunk with its tail up, preparing for a defensive strike. Also on the reverse are the words "PENNSYLVANIA SKUNK," "JAMUL SOVEREIGN NATION," and "AMERICA." PRISTINE PROOF CONDITION -- Your 2015 Silver Skunk Iroquois Proof coin is graded in Gem Proof condition by the Numismatic Guaranty Corporation (NGC). Proof coins are struck with specially made dies to ensure sharp contrast between flat, mirrored surfaces and raised devices. CERTIFIED PURE SILVER CONTENT, NON-LEGAL TENDER -- While these non-circulating one-ounce silver coins, legally authorized by a federally recognized sovereign nation, are highly collectible, they are not legal tender. 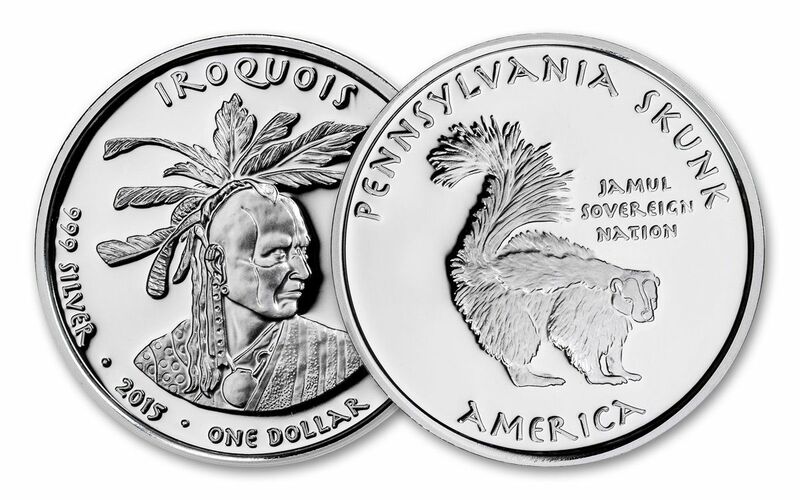 Commemorating one of America’s most well-known tribes, the Pennsylvania 2015 Silver Iroquois Skunk coin can be yours--if you contact GovMint.com, today.